Anyone in the transportation industry is well aware of the shortage of truck drivers. Currently this industry has room for an additional 30,000 to 40,000 truckers. By 2022 experts predict this number could jump to 239,000 and that is a significant truck driver shortage for the industry. In an effort to aide this truck driver shortage, Biagi Bros donated one of their highway tractors to Santa Rosa Junior College. The college program teaches everything needed in order to become a California Commercial Truck Class A driver. ( SRJC Driver Training ) Even though there is no obligation for these students to work for Biagi, the company feels strongly about doing what they can to help with this shortage. Making training more accessible is a step in the right direction. So what’s keeping drivers away? Some say it’s the pay. Any time there is a shortage in the workforce, wages are driven up. This is reflected in the significant increase since 2012 in the national salary average for truck drivers. A shortage also increases the amount workers jump from company to company in search of the best pay and benefits. This can take its toll on employers. Companies such as Biagi that have taken the time and resources to foster a sense of family and compensate their drivers fairly have not been impacted as severely by this. technologies are mandated. This makes it harder to meet the bottom line. Again those companies implementing and investing in more environmentally friendly technologies will in the long term reap the rewards for not only the environment but, their drivers and companies as well. Driving truck has evolved over the years and so have the men and women getting the job done. Not that this job has gotten any easier! New drivers quickly find out that they have a lot of responsibilities and have to pay attention to detail. Drivers need to know everything from schedules and routes, to fuel efficiency and regulations. An increase in the demands made on them is also a factor in the shortage. As more truck drivers retire and the shortage continues, those companies being proactive and thinking outside of the box in attracting new drivers will continue to thrive. Biagi Bros intends to do what they can to help make driving a more desirable career. They support their drivers by keeping up to date with regulations and using new technologies, on and off the road, to help get the job done. They support the training of new drivers in the form of their significant donation to Santa Rosa Junior College. Biagi is also very intentional in maintaining a family atmosphere within their company and continues partnering with the communities they are in to be a positive influence. Despite our current economy, Biagi is committed to investing in the drivers this industry desperately needs. If you are interested in working for a company that cares about the environment, people and a job well done in every area of life, contact Biagi Bros.
Did you know that Biagi Bros has partnered with SRJC Driver Training to provide driver training for drivers wanting to get their commercial class “A” driving ticket? Some companies talk about being environmentally conscious or as it is said, “Going Green” and other companies make a mindful decision to make their operations green. Biagi Bros. is a company that has made the decision to Go Green at the ownership and management level and that green initiative just naturally trickles down throughout the company. The acquisition of natural gas powered, energy efficient regional tractors is the most recent of many environmental projects that Biagi Bros has been involved over the past few years. The company has made a number of planned environmental initiatives including the move to recycled water, from previously using potable water at its Napa Valley Distribution Center for its landscape irrigation. Read the full article here. Significantly the Biagi Bros Van Nuys terminal now features 15 new clean diesel tractors that actually leave cleaner air in their wake. You can read more about that project here. In 2013 all of the Biagi warehouses (over 3.5 million square feet of food grade warehouse facilities) began the process of changing their lighting from metal-halide to newer motion-sensor fluorescent lights that expend 70% less energy. In 2013 Biagi also purchased new low emission Peterbilt tractors replacing some of the older units in the California fleet. These units were appropriately named “Green Machines” and you can read more about them here. With the purchase of these new energy efficient GHG reducing tractors Biagi Bros is continuing to do its part to help create a better environment for us all. What’s all the buzz around the colorful new pipes at the Biagi Bros properties in the Napa Airport Centre? Some may not be aware but, purple pipes indicate they contain recycled water. This water is not potable but can be used for a variety of things from crop and landscape irrigation to industrial applications such as cooling towers and flushing toilets. For Biagi Bros the purple pipes mean an alternate water source for their landscape irrigation making their purple the new green. Not only is the grass green but the business is as green as Biagi Bros can make it. In light of California facing some of their driest years in recorded state history, Biagi Bros has once again shown initiative and their commitment to the environment. They are the first of nine businesses in the Napa Airport Centre to quit using potable water from the City of American Canyon and use recycled water from Napa Sanitation for their landscaping irrigation. California’s regulations for water and water recycling are among the most stringent in the world and have been used as a model for other countries. In Napa County there are very strict watering protocols in effect but, Biagi Bros took it one step further with this latest advancement. The average potable water consumption for Biagi Bros has been 2.6 million gallons per year for outdoor irrigation. The amount saved by this project will supply approximately 24 homes in American Canyon with water per year according to Jason Holley, public works director of American Canyon. Even Jeff Tucker, CFO of Napa Sanitation is excited about Biagi Bros making this change. For every gallon of recycled water being used a gallon of potable water is being conserved. This will have an incredible impact on the community and the environment! By making purple the new green, the bonus is, not only are they being environmentally responsible but also fiscally responsible. Even though this project has had an initial cost of $50,000 to connect with the recycled water system, they will save over $21,000 per year. Napa Sanitation currently charges $6.69 per thousand gallons of potable water and just $1.01 for the same amount of recycled water. It won’t take long for the savings to add up. This project is another exciting reason why Biagi Bros continues to show their staying power in today’s market. Imagine the impact using recycled water could have on Napa County as other businesses follow suit. If you are interested in working for a company that cares about the environment, people and a job well done in every area of life, contact Biagi Bros. Did you know that Biagi Bros has partnered with SRJC Driver Training to provide driver training for drivers wanting to get their commercial class “A” driving ticket? In a global market where goods are moving faster and further than ever and the strength of our economy is affected greatly by our ability to move freight, the freight transportation industry has had to be innovative and dynamic to keep up. Add to this a growing awareness and demand to handle environmental concerns responsibly and you have the birth of the SmartWay Program. Biagi Bros is a proud supporter of this program and continues to be a front runner in going green by implementing many practices and technologies that meet and often exceed SmartWay standards. Since 2003 the EPA has been collaborating with the freight transportation industry in this market-driven partnership to significantly decrease its carbon footprint. The launch of the program in 2004 is a voluntary initiative that partners the EPA with all areas of the industry to ship and carry goods in a way that improves efficiency. From policy and technical solutions to research and evaluations the SmartWay program is always looking for better ways and technologies to improve the handling and transportation of freight. Transportation is an industry that often gets a bad rap for contributing to the use of fossil fuels, carbon and nitrogen oxide emissions, and particulate matter emissions. Companies like Biagi Bros who have adopted the SmartWay Program have not only significantly decreased their carbon footprint but, have also reaped the rewards of decreased costs in their businesses. SmartWay program trucks are operated with greater efficiency and utilize equipment that reduces overall fuel consumption. Biagi Bros is a forward thinking company that uses their network, warehousing, and transportation resources to maximize efficiency and minimize environmental impact. Last year Biagi put a fleet of fifteen Freightliner transport trucks on the road that not only have cleaner exhaust consisting of hydrogen and water, but are also 15,000 lbs. lighter, which translates to a 10% reduction in fuel costs and less wear and tear on America’s highways. Only a handful of transport companies have these trucks on the road. Biagi has also shown their innovation and concern for the environment in their most recent project which uses recycled water for their landscape irrigation at two of their warehouse properties. They are the first of nine businesses in the Napa Valley area to stop using scarce and precious potable water for irrigation. On top of making a better choice for the environment, they will also save over $21,000 in water bills over the next twelve months alone. There are nearly 3,000 companies and associations who have adopted various components of this program and it continues to grow as it moves north into Canada. Biagi Bros continues to be one of those dynamic and innovative companies in the industry. Continuing to look for ways to reduce their impact on the environment has also allowed them to reduce costs in an age of increase. This translates to being able to pass those savings along to their valued customers proving that doing things the smart way is indeed better. “To whom much is given, much is expected”. Whatever you particular political affiliation, this famous quote by John F. Kennedy represents a sentiment held by many of us in America. At Biagi Bros, we don’t want to take our success for granted; we believe wholeheartedly in giving back. Greg Biagi called out his good friend – (and one of his all-time favorite baseball players) – Barry Bonds. Greg first met Barry through a fundraising function for the UCSF Medical Center in San Francisco. He also called out Tom Wyness, Senior VP of Crown Imports (Constellation Brands Beer). Tom is well-liked by all of us here at Biagi Bros. He is very active in charity work for the V Foundation for cancer research. And last but not least, he called out Barbara Banke, owner of Jackson Family Wines. In a joint venture with Biagi Bros, Jackson Family Wines operates the largest wine distribution center in Northern California. When we think of the word “charitable”, we think of Barbara Banke. Fred Biagi called out David Ragan, driver of the 98 Ford Mustang (Nationwide Series). While he might prefer to be doused with ice-cold champagne, the Ice Bucket challenge is a great cause and Fred know David would be all over that. Fred also called out his friend, Mike Matthews. Owner of Napa Auto Parts in Sonoma County, California, Mike is a long-time friend from high school. Fred’s partner and co-sponsor of the aforementioned 98 Ford Mustang, Bill DenBeste was also called out. Bill is the VP of DenBeste Transportation out of Windsor, California. While he too would be thrilled with a dousing of ice-cold bubbly, the Ice Bucket challenge is a charity close to Bill’s heart as well. Biagi Bros extends our thoughts and prayers to the sufferers of ALS and the friends and family who suffer along with them. May a cure be found soon. The air has gotten a little cleaner in California thanks to Biagi Bros’ Van Nuys terminal. Fifteen brand new, state-of-the-art Freightliners just hit the highways, leaving cleaner air in their wake – literally. The exhaust from these trucks is comprised of hydrogen and water. Those images of semis spewing black diesel exhaust will eventually become a thing of the past, but since we like to be on the forefront of the latest advancements in technology, the arrival of these 2015 trucks has been highly anticipated. 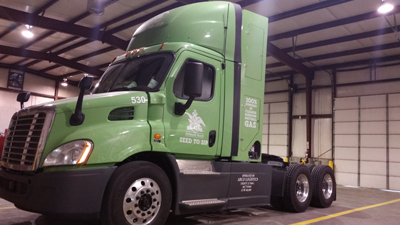 These new low emission Cascadia Freightliners are equipped with a DV-13 engine. Engineered and manufactured in Germany, this clean diesel engine has been in use for several years in Europe, at this point less than a handfu l of US companies have made the investment in this equipment. There is no question that other supply chain providers will be following suit eventually. Refurbishment of a Freightliner factory in Detroit is underway in anticipation of the coming demand. 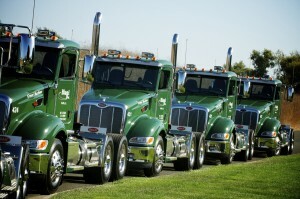 The engine is only part of the buzz surrounding these new green trucks. They also feature a 12-speed automatic transmission and are 15,000 lbs lighter than the lightest trucks on the road, which translates into optimum fuel economy. With speed governors in place, we anticipate a 10% reduction in fuel over the 10-speed manual transmission day cabs being replaced. The “virtual Technician” program is another feature of the new green machines that we are really excited about because it will help us take customer service to another level. A good maintenance program has always been the key to minimizing breakdowns and downtime which is paramount to on-time delivery. However, we don’t live in a perfect world and even the best maintenance program can’t eliminate every potential problem. This is where the Virtual Technician program comes in. Trucks are equipped with an on-board computer remotely connected to a diagnostics center at Freightliner. If a warning light goes off, or the driver senses a problem, a qualified technician at Freightliner can perform an immediate analysis and advise the driver or fleet manager as to how best to proceed. Should servicing be required urgently, Freightliner will provide Biagi Bros with a directory of the closest approved service centers, as well as inventory information regarding the availability of parts and how long the repair should take. Because problems can be diagnosed in real time, our fleet management team can make well informed decisions. If a second truck needs to be dispatched, we will be able to arrange it right away. Anything that can be done to keep on schedule and reduce down time means better business for our customers and for us. At Biagi Bros, we want to do all that we can to promote the success of our customers. Going leaner and greener with the new 2015 Freightliner Cascadias is helping us do just that. Planning, arranging, and buying transportation to move your freight–traffic management–might be the most critical aspect of logistics. Freight consolidation, carrier costs and selection, tracing and expediting, and all the other duties involved in this all-important job all work better through a third party logistics (3PL) service provider. In the end you’re saving a wealth of time and money by using a 3PL service provider, eliminating the need to invest in warehouse space, technology, transportation, and staff to execute logistics. Save yourself from costly mistakes, and allow your business to build a global logistical network with lower risk and higher return. These results are average. Your company might do even better. resource network–allowing each step in the supply chain to be executed in the most efficient, cost-effective way by leveraging relationships and volume discounts not available in-house, thereby lowering overhead and expediting service. reduced time and effort–no need to worry about the paperwork, billing, audits, training, staffing, and optimization throughout the supply chain. focused expertise–combined industry best practices, the latest technology, software capable of advanced reporting, inventory management, visible monitoring of the entire process, and just in-time practices. Outsourcing logistics to seasoned, reliable professionals allows you to focus on your core competencies. scalability and flexibility–scaling space, labor, and transportation according to exact inventory needs, utilizing more space and resources when needed, allowing your business to grow into new regions without barriers through strategically-located distribution centers and warehouses for expeditious shipping of goods anywhere in the world. continuous optimization–using the fastest, most efficient, and cost-effective methods available to restructure the supply chain with sophisticated management software analyzing and monitoring practices continuously to eliminate inefficiencies and streamline the supply chain. Through these advantages 3PL services providers help you maximize profits, reduce wait times, and improve customer service. Selecting the right logistics company to manage your company’s supply chain is of vital importance to the future of your company’s operations. At Biagi Bros, we know greater efficiency in the freight business means enhanced cost effectiveness for you. Our integrated logistics optimization program increases efficiency and assist shippers like you in trimming your overall freight costs by . .
. . we are able to help our customers realize a substantial reduction in freight expenses, capital expenditure, and the time and effort required to make things go in-house. With 12 strategically located warehouses and hubs in California (5) , Texas (2), Washington, Illinois, Arizona and Florida, Biagi Bros delivers regionally and across the continental United States. A seasoned, highly-skilled dispatch team, working with well-trained drivers, we provide consistent and dependable solutions for your logistics needs. Advances in technology and global business exposure due to increased internet-based purchasing through smartphones and computers have given companies greater opportunities for tapping a rich vein of marketability and virtually unlimited visibility for their brand, products, and services. Larger companies with a solid logistics infrastructure see little impact on their overall shipping and distribution processes due to the revitalization of customer demand on an international scale. For smaller companies or previously geographically-restricted businesses, the ability to provide products to a global audience also comes with the challenges of managing an effective logistics process. 3PL providers usually work closely with the company to whom they are providing services to ensure that the company’s needs are being met at every stage of the supply chain. They also generally offer the ability for companies to remotely manage logistics processes, track movement of shipments, view and make adjustments to inventories, and modify other aspects of the different stages of packaging, warehousing, and shipping processes in real-time, 24 hours a day. This is typically done via online utilities that give a 3PL client the flexibility to manage all those factors from their home or office via computer, laptop, or internet-enabled mobile device. Those are just a few of the numerous benefits of outsourcing logistics and supply chain needs to a third-party provider. It’s a win-win situation for both parties involved, and due to a company’s ability to monitor, make changes to, and track their supply chain in real-time, there are no real disadvantages to obtaining the services of a 3PL provider. The logistics realm is a highly competitive environment because of the numerous benefits outsourced supply chain processes offer to companies of any size, no matter what level of demand the company’s merchandise is exposed to. 3PL providers are stepping up their game to provide the highest standards of customer service through the establishment of close working relationships and assurance of the importance of your logistics needs to them on a business-to-business level. After all, your business IS their business.